A series of breathtaking 800m runs highlighted day five of the AAU Junior Olympic Games in Ypsilanti, Michigan. 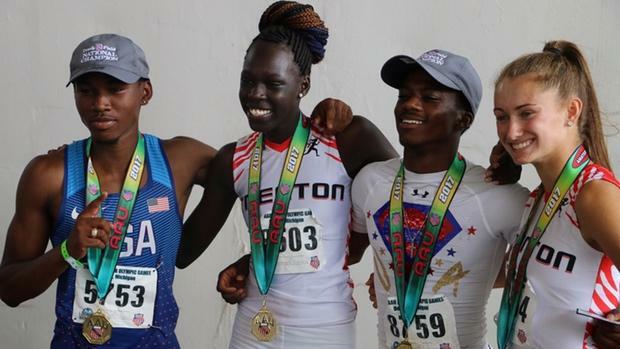 The Ultimate Speed Academy (St. Louis) standout lowered his own freshman class record and broke an AAU national record when he blasted a 1:49.87 victory in the 800m final at the AAU Junior Olympic Games. The performance took place one day after Miller won the 1500m in 4:02.59, three seconds shy of Jim Jennings' hand-timed standard of 3:59.2 set in 1980. On Monday, Miller executed an inspiring run when he fell and got back up to win the semifinal of the 800m. The 1500m victory coupled with the near-disaster of the 800m semifinal, gave Miller the right amount of momentum heading into his signature event on Wednesday. The 800m crown marked Miller's seventh AAU Junior Olympic Games title of his career. Three-time Olympian Hazel Clark commended Cha'Iel Johnson's performance when she won the 12-year-old girl's 800m in 2:13. Watch her race here. And Chai'el's dad, Chad, didn't have a bad one, either.